In order to also guarantee a high degree of flexibility in industrial environments, Datalogic has expanded its PowerScan 9500 Series to include a Bluetooth variant. 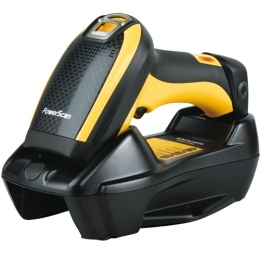 The PBT9500 offers a radius up to 100 m, a powerful scan engine for 1D and 2D barcodes and extreme robustness for use in any surrounding. For assembly lines and other industrial work areas the PBT9500 gives you everything you need: it is robust and withstands drops from heights of 2 m, is IP65-certified and fully operational within a temperature range of -20 to +50 °C. Even during longer periods of operation the battery lasts longer than one shift: up to 30,000 scans are possible with one charge. According to the barcode resolution the PBT9500 has a scanning radius from direct contact up to 1 m. For particularly high resolution barcodes choose the high performance version over the standard variant. The high performance version is equipped with a highly innovative liquid lens, and combines the high density, extended range and standard variants in one device.